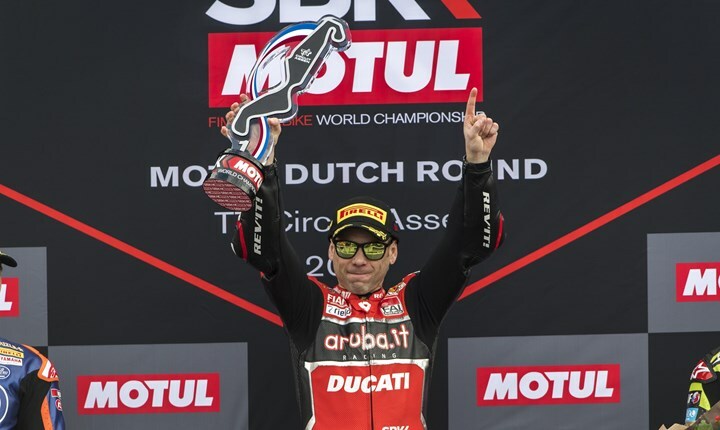 Alvaro Bautista's dominance of this season's Superbike World Championship (WorldSBK) continued at the weekend (13/14 April) with another double win at a chilly TT Circuit Assen, bringing his tally to an unbeaten 11 and setting a new championship record. Bautista took the first race from reigning champion Jonathan Rea, who made an incredible start in race two at the Dutch circuit but couldn't hold off the Spaniard. Rea catapulted from eighth on the grid to take the lead and battled hard in the opening laps, but a slick inside move from Bautista on lap six put him in front until the flag fell. Rea and local favourite Michael van der Mark then played cat-and-mouse for second place, colliding on the final lap and taking it right to the line, with Rea having to settle for third by 0.018s. Donington Park local Leon Haslam finished fifth in race one after tussling with Alex Lowes, but struggled home in eighth in race two despite some strong mid-race lap times. The weekend was hit by severe weather, with a snowstorm causing Saturday's race to be postponed until Sunday, forcing the cancellation of the Superpole race. Bautista's clean sheet of wins in the opening 11 WorldSBK races sets a new record for the championship, and he's also equalled Rea's record of 11 consecutive race wins set in 2018. Expect to see plenty of fireworks when the Motul FIM Superbike World Championship heads to Donington Park on 5-7 July for its only UK round. Adult tickets are available in advance from £25 and kids under 13 go free all weekend. For more information click here.